A Barnsley Historian's View: When your Name is Not your Name? When your Name is Not your Name? 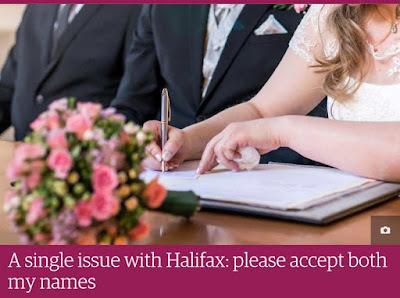 This morning I read, with interest, a Guardian item on the difficulties one lady was having with her bank over her use of both maiden and married names. My case is slightly different, however my names have caused me some difficulties over the years, and more particularly in the last few weeks. I am commonly known by my middle name, and have been all my life. Why my parents chose to register my name (and have me baptised) as A. L. and then called me L. is a mystery, my 79 year old mum cannot remember any particular reason for their decision. The only places where I am accustomed to being addressed as A. are hospitals and the Student Loans Company (with whom I have an even more complex name problem at the moment). Even my GP calls me L. by the simple expedient of underlining that name on my notes or more recently by entering my preferred name in a field for that purpose on their computer system. A few years ago I started to give talks to small church and community groups on local and family history. I used L. (surname) on my leaflets and my blog advertising my talks. I was frequently paid by cheque, and often these cheques had been made out in advance because of difficulties within the group in getting multiple signatories together. This meant that it was difficult to ask for a cheque to be rewritten if it was directed to me as L. (surname) rather than A. (surname). Sadly, due to my progressively worsening health, I can no longer give the talks as I cannot guarantee being well enough on a particular day to fulfill my commitments. I do miss the social interaction and the stimulus of having to prepare new material. Santander refused to accept cheques written to me as L. (surname) a few years ago, despite my joint bank account with my husband being in my full name and my driving licence, with photo id also displaying my full name. I now pay cheques in my middle name into my individual Post Office account, set up (after some struggle) when I left work due to my ill health and needed an accessible bank near our home. Because the Post Office staff in the little suburb where we live recognise me and accept my explanation for the occasional cheque directed to L. (surname) I have had no problems with these cheques being returned. I now ask my mum to write cheques to us in my husband's name rather than mine (she has an old fashioned conviction that a man should always appear to pay in restaurants even though it is her intention to remburse us as soon as she gets home) in order to avoid difficulties with Santander. She always calls me L. and writing a cheque to me as A. seems a bit odd and unnecessary to her. I even request that any Christmas gift cheques are addressed to him to avoid the possibility of them being returned. It does make me feel very much like an adjunct to my husband. Which is ironic considering the situation with my surname. My difficulties with the Student Loans Company revolve around my surname rather than my forenames. I confess that I just let them call me A. It is easier. In 1985 I married for the first time, in 1992 I divorced and changed my name to my mother's maiden name, carefully chosen to have meaning to me, but to be different to both my maiden and married names. In 2004 I remarried but kept my own name with my second husband's full agreement. One of my reasons for this was that my professional qualification was in my chosen name, and my subsequent Open University study and qualifications were all in that name. This year's application for Student Finance to do a Distance Learning MA in the History of Britain and the First World War with the University of Wolverhampton, has been rejected because I no longer have a valid passport. I have provided my birth certificate and my statutory declaration (my name change document from 1992), but now they want my marriage certificate from 1985 as well. They do not care a fig that I am married to an entirely different man now as I did not take his name. A suitably qualified friend has filled out the necessary form to confirm I am who my birth certificate says I am, but this is apparently not enough. I was told, during a long phone call (whilst being addressed as A. ), that they need me to prove the link between my birth name and my first married name. This, despite me having the same account with them as I had when I first applied for Student Finance during my Radiography training (1990-1993) under my first married name, and having shown both my birth certificate and marriage certificate to the admin staff at the then North Trent School of Radiography (which, ironically changed its name twice whilst I was there, firstly to the Sheffield City Polytechnic and then to the Sheffield Hallam University!) From the dates I give you can deduce that I divorced and chose my current name whilst undertaking that study, and having informed all the necessary authorities my final certificate was issued in my chosen name. The same one I now have and retained on my second marriage to avoid difficulties! The Student Finance people can apparently see that I had a passport in 2011, that I was called by a different name when I first registered with them in 1990, and that I have now produced my birth certificate to them on at least three separate occasions. I have also supported both my children's applications to them for their respective university study, using the same account reference. This will have involved providing them with financial information and details of my employment. I have sent away for a copy of my 1985 marriage certificate, which has cost me £9.25. It will not arrive in the post for another week. Then I have to send it to the Student Finance people and wait goodness knows how long for them to cogitate on it. Names. Do we own them? Even if we choose them ourselves in order to demonstrate a break with the past they still come with all the baggage of our previous history. Why is a passport so superior a document for proving who you are? I have had my photo id driving licence for many years and that is accepted as final by most institutions. But not the Student Finance people of course. I don't write blog posts very often these days, but this situation has me very annoyed. This post will serve as a record of the situation that I can look back on in years to come and laugh. Well, I can always hope. Thank you for reading, I welcome comments, but I do moderate them to avoid spam so they might take a day or so to appear. Thank you for reading Keith, It was lovely to get a comment from you. Happily my 32 year old marriage certificate arrived in the post yesterday (Friday) and I have set it off. Fingers Crossed!